Keep outdoor grime outdoors and cover hot spots and wounds! 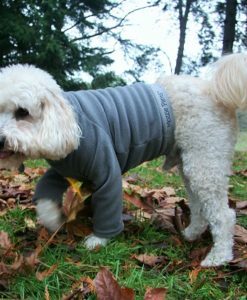 Fleece and cotton tops and pants. 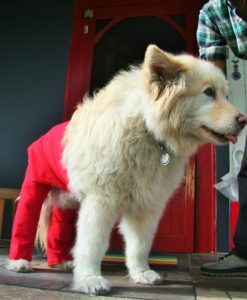 Original Pant, use indoors for marking, submissive peeing, incontinence and females in heat! 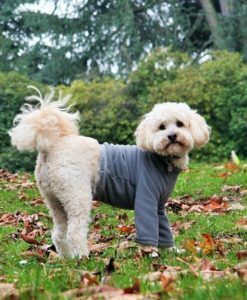 Dr. Temple Grandin “Noise-phobic dogs can benefit from wearing a tight T-shirt” (AKC.org). Use outdoors to keep clean, cover hot spots and wounds. 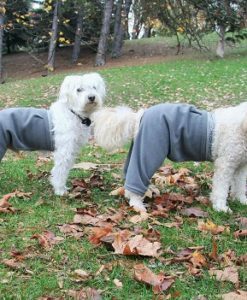 Walking Pant and T Shirt. 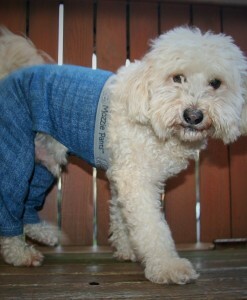 Check Out Our Featured Dog Clothing, Dog Pants, Dog Suspenders and Dog Shirts! 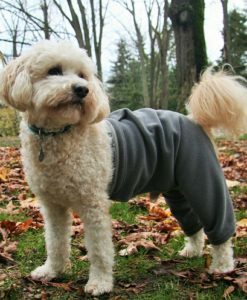 Mozzie Pants - Dog Pants & Dog Tops Receives 2017 Seattle Award Seattle Award Program Honors the Achievement SEATTLE June 1, 2017 -- Mozzie Pants - Dog Pants & Dog Tops has been selected for the 2017 Seattle Award in the Pet Supplies category by the Seattle Award Program. Each year, the Seattle Award Program identifies companies that we believe have achieved exceptional marketing success in their local community and business category. These are local companies that enhance the positive image of small business through service to their customers and our community. These exceptional companies help make the Seattle area a great place to live, work and play. Various sources of information were gathered and analyzed to choose the winners in each category. The 2017 Seattle Award Program focuses on quality, not quantity. Winners are determined based on the information gathered both internally by the Seattle Award Program and data provided by third parties. Mozzie Pants won 2nd place for Best Product at the Celebrating Dreams Celebrating Success 2017: A Night for Women Entrepreneurs. Hosted by Business Impact NW and Washington Womens Business Center! 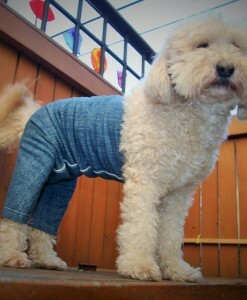 Jax loves his new Mozzie Walking Pants! He uses them when he runs in a field to keep the stickers off his lovely coat. 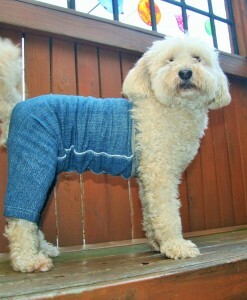 See Jax’s photo on Club Mozzie Pants page! PJ our show Samoyed has a real challenge with a huge hot spots on his back end. The Walking Pant covers them perfectly and it fits so great. He loves the fabric and comfy fit. He doesn’t want to take them off!! 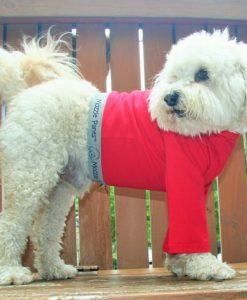 Gordon loved his Mozzie Pants T-Shirt, it made him feel confident and spiffy for the adoption event!! 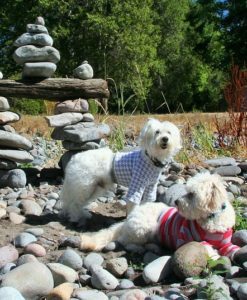 Louie is our 14 year old retired show dog who gets a little cold and he loves his T-shirt, the perfect fit, comfy and just the right amount of warmth for his old bones. Great product line that is functional!! Nothing like it on the market…genius!! Listen to the radio interview on “About Us” page at https://mozziepants.com. Jules was very accommodating and answered all my questions promptly and mailed out our order the same day. Our boxer girl just had surgery on her knee and won’t do the cone. These work perfect! 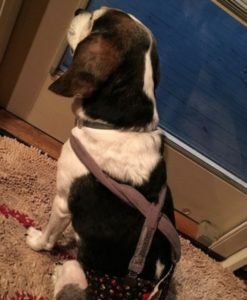 We did get the suspenders to help hold them up. Thank you! I love this and was in desperate need of something after my dog had surgery to have a cyst removed from her right shoulder. 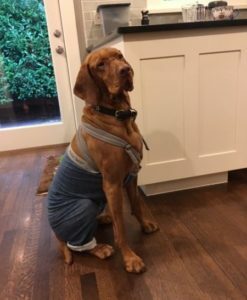 We needed something to help keep her from scratching at the long incision/stitches and covering it up with easy to put on, dog friendly clothing was just the ticket! The best place to get updates is on our social media locations, Face Book, Instagram, Twitter. All listed as Mozzie Pants or you can go to the links on the website.